If you wish to get better in your statistics class, a calculator designed to tackle statistics math is a must-have. Unfortunately, such calculators come at hefty price tags which makes choosing a cheap and functional model a complicated task. In this article, we’ve narrowed down the most affordable calculators for statistics. You will not only be able to use these calculators in class, but they are also allowed into exam rooms. The best calculators for statistics 2019 feature advanced technologies that make math solving a breeze. You will find them useful from the beginning to the end of your course year. What is the Best Calculator for Statistics in April, 2019? Generates QR Codes, Complex models Solar with battery backup ⭐️⭐️⭐️⭐️⭐️ Check our Review! Table features Solar with battery backup ⭐️⭐️⭐️⭐️⭐️ Check our Review! Simultaneous and polynomial solver Solar with battery backup ⭐️⭐️⭐️⭐️ Check our Review! and cash flow analysis Battery powered ⭐️⭐️⭐️⭐️ Check our Review! 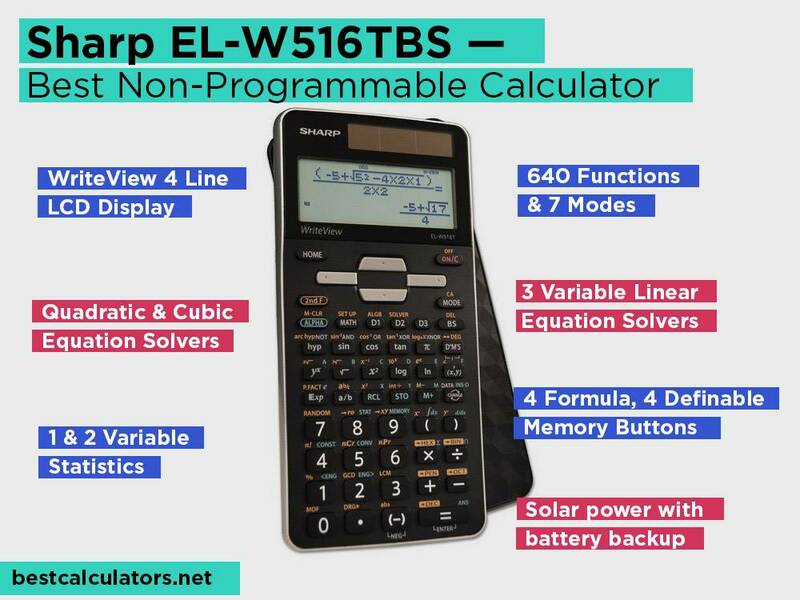 Sharp EL-W516TBS 4-line WriteView LCD Display Color-coded plastic keys Logarithms, trigonometry, reciprocals, roots, Quadratic and 3 variable equation solver Solar power with battery backup ⭐️⭐️⭐️⭐️ Check our Review! 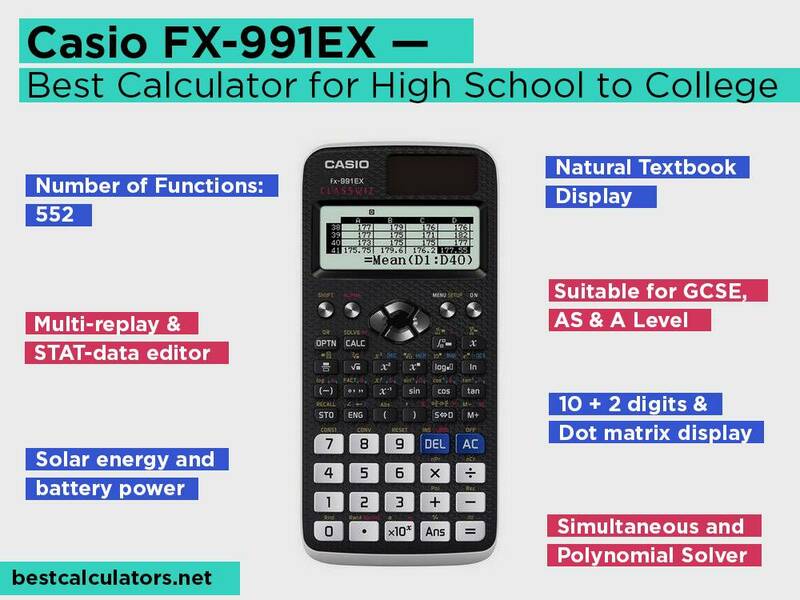 The Casio FX-991EX is considered the new classroom standard. It features some of the most intuitive features to make learning enjoyable. It is a high-performance scientific calculator that raises the bar when it comes to quick math solving for the most complex math calculations. This model has been designed to improve the accuracy of high stakes math tests so that you can come out on top of your class. This calculator features an extensive set of advanced calculations. It has a spreadsheet function which is of utmost importance in statistics. It allows you to execute data calculations such as the mean, max, min, and sum of large numbers. It makes it possible for you to enter recursive formulas and calculate using advanced Riemann functions. If you are studying statistics at the basic level, you will be impressed by the level of simplicity in handling fractions and rational numbers. It can handle up to a 4×4 matrix plus there are functions for prime factorization and ratio calculations. And as you take statistics in higher levels, you will still use this tool for differential and integration calculus. 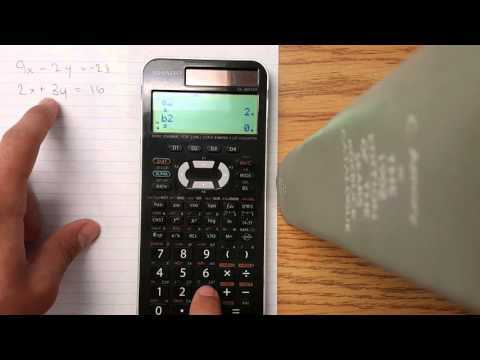 This calculator can input and display logarithms, fractions, and formulas just as they appear in your textbook. It enhances the learning process by allowing you to interpret results more efficiently. It also includes an interactive menu that makes it quick to navigate even if you’ve never used a Casio calculator before. When you want to visualize a certain calculation, this model comes in handy as it can generate the QR code of that particular formula. It uses a simple operation so that the information derived from the calculator can be displayed on a smartphone or tablet screen. Overall, Casio FX-991EX proves reliabile for the most demanding statistics classes. It favors both beginners and advanced learners. This calculator is not your usual scientific calculator. 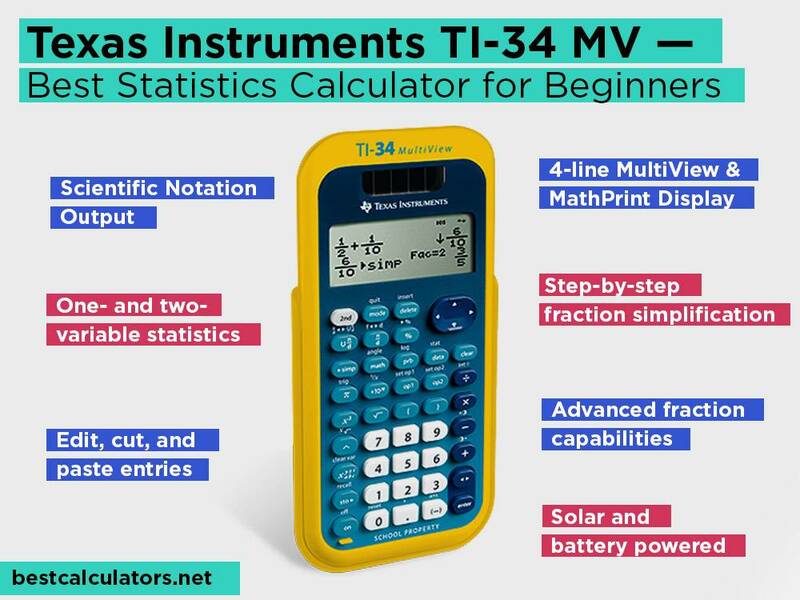 Texas Instruments TI-34 MultiView offers much more functionality for statistics. It comes with advanced fraction capabilities to help solve middle school and high school math and science. This model will set you on a path to handle more complicated math as it entails MathPrint and Multiview technology for simple input and display of functions and formulas. The TI-34 model features a 4-line display which uses MultiView technology. You can enter more than one calculation making it easy to compare results on one screen. Using the MathPrint feature, this calculator displays numbers, formulas, and functions just as they would appear on the board. Instead of getting results in decimals when calculating fractions, you will get your answer in the simplest fraction. Since you can explore patterns in the same screens, it makes it easier to understand the reason behind results. This way, you can apply what you learn in real life situations and even get better at solving questions that require a series of calculations. With this calculator, you can simplify fractions and change them to decimals, and change decimals into fractions. It allows you to get the exact output in an ideal manner. It comes with simple pull-down menus that are easy to read. You will find that the menu resembles that of a graphing calculator which means you’ll get to a desired function in quick and easy steps. You are looking at a calculator that uses sturdy plastic keys. You will be making fast keystrokes which is sure to save you time especially during exams. This model also uses solar power with a battery backup. It will probably never need a replacement of batteries since it comes ready to use. We like that there’s a slip-on hard-case which protects it from falls. 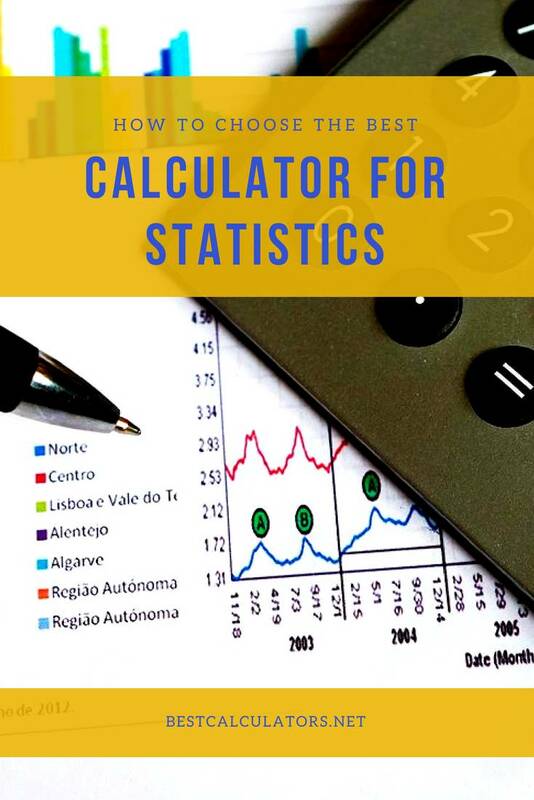 Although you may not get to use this calculator for advanced and complicated statistics math, it sure lays a foundation for better understanding. From the MathPrint and MultiView features, you have a winning calculator only found in Texas Instruments models. 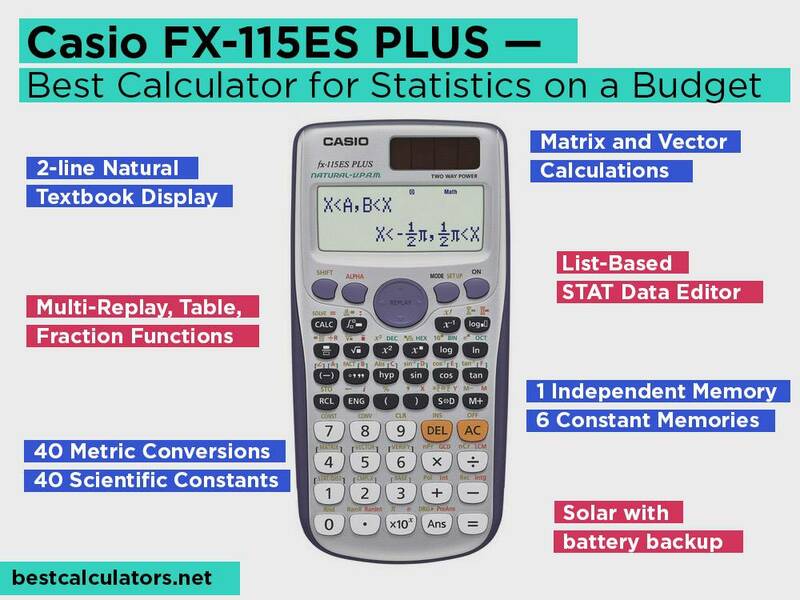 The Casio FX-115ES PLUS just made math simple with up to 415 inbuilt functions. It can tackle statistics, linear regression, base arithmetic, standard deviations, number calculations, polar-rectangular conversion, and even computer science. 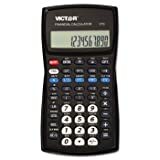 Even with so many functions, this calculator is tailored at a very reasonable price. This is a tool you don’t want to ever leave behind when tackling math problems in class and exam rooms. It will come in handy for fraction calculations, hyperbolic functions, trigonometry and log features, and many others. You will like that it can also solve higher mathematical tasks that are the base of advanced statistics. This model is also designed for general math such as algebra and calculus. If you are in high school, you can depend on it then, and use it when furthering your education in college. Its pocket size allows you to take it anywhere without feeling as if it’s bulky. Just like the Casio FX-991EX, this model has a natural textbook display. It has a 2-line display which helps you to see the calculation and the result in one screen. This means you can easily relate the answer to the question which will guide you in further problems. It uses the standard scientific display notation to simply results and operations of long numbers. 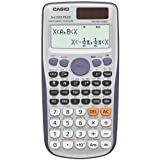 Casio FX-115ES PLUS allows you to backtrack calculations step-by-step such that you can reconstitute an expression and recalculate the answer. This function also comes in handy when you want to make quick calculations of long expressions, and you don’t want to go through a lengthy calculation process. It has six constant memories where you can store results and formulas for future calculations. It also comes with 40 metric conversions which aid in units and measurement calculations. Whether you are in high school or college, the Casio FX-115ES PLUS can handle it all. It is more sophisticated than regular scientific calculators. It can not only solve statistics math, but it’s good to deal with engineering problems. This calculator is aimed at the student who is interested in the financial industry. It has functions for statistics math that relate to the world of business. It features more than 128 functions where you will be able to familiarize yourself with real-life problems that need analytical solutions. It is ideal if you take various courses that surround a specific major like economics. As such, it will be an essential tool in statistics, accounting, and other business classes. This calculator is great for solving various financial problems. It has functions for solving mortgages, leases, savings, annuities, and even generate amortization schedules. This model can perform cash flow analysis and also helps in time value of money calculations. This means you’ll be able to apply the solutions on class and real financial situations. This calculator can also handle interest rate conversions as it can convert between nominal and the effective interest rates. You will also like that it can calculate depreciation, bond prices and yields, and breakeven points. The calculator has ten memories which make it easy to store formulas and functions. 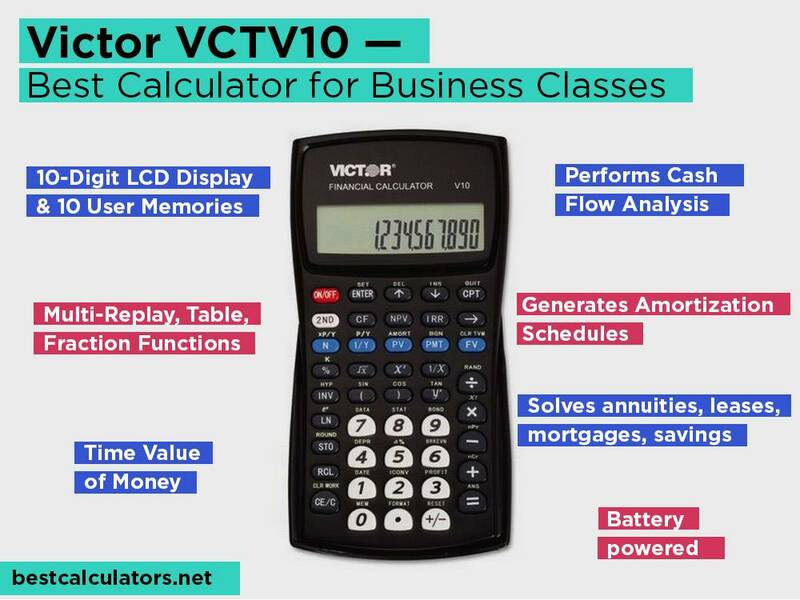 The Victor VCTV10 uses a 10-digit LCD. It’s not the most intuitive since it is a single line display which indicates it will be a bit tricky to associate some answers with the question. You will, however, like that it has color-coded keys making it easy to input numbers with less hassle. It will take less time to get your answers thus exams will be faster to handle. Overall, if you major in finance math, this calculator will prove very useful. It is accepted into professional financial exams, and it comes with a nice hardcover to protect it. Sharp continues to be top of the game by producing some of the most sought calculators. The Sharp EL-516TBSL is an advanced model with a 4–line display. Just like the Texas Instruments TI-3, you will be able to enter two calculations and compare the results side by side. It is an efficient statistics problem solver which will not cost you more than you’d like to spend on a statistics calculator. This is a model that comes recommended for both professionals and students. It has 640 functions that cover a wide array of applications. From performing trigonometric functions to roots, powers, reciprocals, algebra, calculus, and sets of equations. It will help you determine arithmetic units like mean, mode, and median. It comes with seven modes including Normal, Complex, Drill, Matrix, List, and Equation. It helps you change the data and solve simple problems to the most complicated, complex number problems. This means you have numerous ways of changing the number systems to suit a particular situation. You will be working with a natural display with lets you see symbols, expressions, and fractions as they appear in the textbook. This allows you to see the working behind a certain problem which in turn helps you to show the same work to your teacher. This helps the learning process since you will never pull an answer for an exam paper without going through the process of getting to the solution. Speaking of exams, this calculator can be admitted in major tests from mid-school to college. It is approved for SAT, AP Physics, PSAT/NMSQT, Math IC, AP Chemistry, and IIC exams. From the many functions, it is clear that this calculator will be of great help. It has sixteen memory functions, three variable linear equations solvers, and a 4-line LCD. It is reliable all through your school years, so you better be prepared to have it around for a long time. Buying a statistics calculator is a valuable investment. But you have to sift through numerous models to get to the one you want. We don’t want you to go on a trial and error spree, here’s a small guide to point the way. 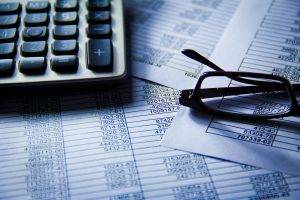 Why do you need a statistics Calculator? If you are majoring in statistics, you will encounter questions like the significance of the differences in a certain percentage. You will also be asked to perform statistical analysis or estimate a sample size without analyzing tons of raw data. The only accurate method of giving correct answers is by using a statistics calculator. It gives you instant answers without delays so your math lessons can go smoothly. These calculators, like the Casio FX-991EX allows you to input data into a spreadsheet for analysis. It gives you answers regarding the median, mean, and mode just by keying in a few inputs. You will be able to compare and understand systematic samples for smooth execution of results. Most statistics calculators also happen to be scientific calculators. With the need of making multiple comparisons, these calculators allow you to enter more than one calculation when trying to derive a pattern. They also provide a natural textbook display to improve understanding of complex concepts. With these calculators, it is no longer necessary to cram a long formula since they have memory functions for that. All you have to do is retrieve the formula and input it in the calculation to get the correct answer. Now you can get answers in less than half the time it would take to use a pen and paper. Can be hard to master. 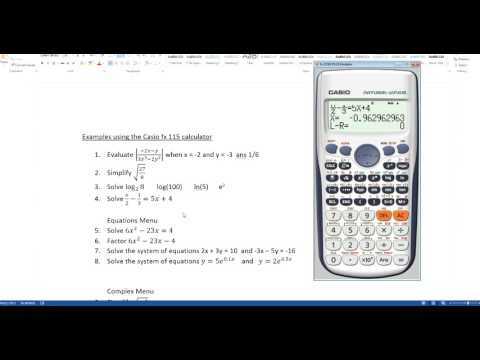 You must be up to using a scientific calculator to reap all the benefits of this calculator. This means taking your time to learn the different functions which can be a challenging process. It calls for patience and a serious student to take advantage of the full functionality of calculators for statistics. Which are the essential functions of a calculator for statistics? 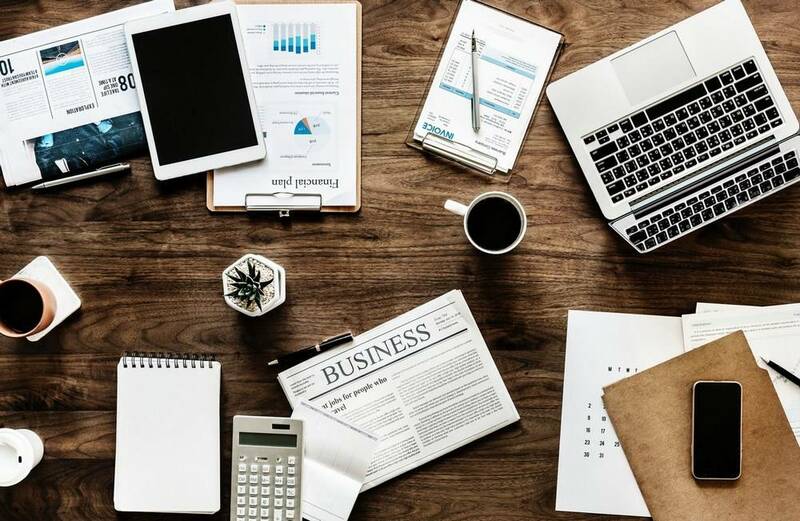 To attain the full benefits of a statistics calculator; it is vital that you understand which functions are essential to look for in this type of calculator. The converting feature allows you to change the calculator mode from math mode to fraction or decimal mode. Other essential keys include the exponential (ex), pi, log base, shift, ab/c functions. This key allows you to store a series of numbers such that you can retrieve them for later use. Your calculator will mostly have an M+ key which indicates where to input the numbers you want to store. The Min key will also help you to enter multiple numbers at once in the calculator’s memory. A statistical calculator can perform a definite integration using three simple steps. That is by just inputting the function with variable x, upper limit, and lower limit. This allows you to change from math mode to fraction mode. It is useful for simplifying fraction and solving fractions with whole numbers. A statistics calculator allows you to calculate the variance, mean, and standard deviation from a data set. For example, if you have a set of 10 numbers, the calculator will help you to get the sum of these numbers and proceeding to help you follow the steps of obtaining the variance. Find the variance and standard deviation of 1,2,3,4,5. I divided the number in step 4 by the number in step 5: 10 / 4 = 2.5. This is my Variance! Finally, I took the square root of the number from step 6 (the Variance), √(2.5) = 1.5811388300841898. This is my Standard Deviation! 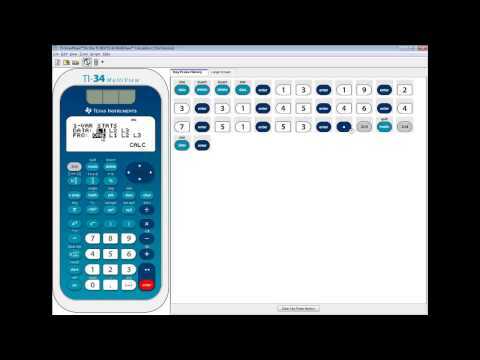 As you can see, your calculator will help you to input the various functions to arrive at the answers. Apart from being able to perform more than the basic functions on a calculator, both scientific and graphing calculators allow performing of statistics math. The only difference is that a scientific calculator will not be very efficient for calculus and matrices because of the small screen. On the other hand, graphing calculators allow you to see the expression and its graph on the same screen. Also, if you need to evaluate data from scientific devices, it will not be possible with a scientific calculator. This is because they do not have Wi-Fi capabilities which enable reading of data from electric thermometers, decibel meters, meteorological gauges, light meters, etc. Teachers and professionals agree that computers and statistics calculators are essential instruments throughout the statistics course. But which one is better than the other? Assuming that a student can gain access to a computer, students have lots to gain from a computer. This includes a large screen which displays detailed text and graphical statistics. A computer has a high number of statistical functions, and it has high probabilities of upgrading. But computers are cumbersome, expensive, and can’t be allowed into exam rooms. You should be able to take advantage of both tools in statistics as they provide invaluable usage in the areas they are best in. If you are looking for the ideal calculator for statistics, this list is all you need to make a choice. We have carefully selected these models to fit into their specific categories. Whether you are in mid-school, high school, or college, you will find a calculator tailored to your specific needs. i have a Texas Instruments TI-34 . i really love it for its multifunctional design and best performance. now want to buy another TI version. is there any new version for TI?